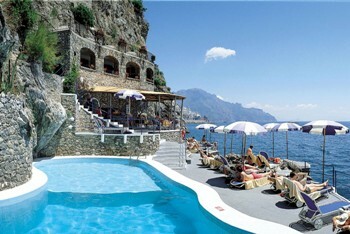 Impressive resort perched on the top of a cliff with a breathtaking view on the Mediterranean sea. This hotel offers many facilities: swimming pool, gym, private beach, and beautiful botanic gardens. The interiors are carefully designed to create a comfortable yet elegant enviroment. It is possible to arrange the wedding reception in one of the hotel’s two award-winning restaurants both famous for their extraordinary cuisine. This venue is a perfect choice for those who wish to organize a luxurious wedding, in front of the romantic Amalfi Coast and for those who want to enjoy the hotel’s honeymoon suites after the ceremony for a wonderful relaxing holiday.